Every first Friday of the month we sail the famous "Cat Team Races". 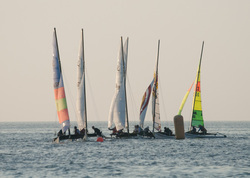 This is a combination of "very serious racing" (for the top 3-4 teams) and a "great sail with friends" for all. The basic principle is that at least two pairs of helm/crew per team sail a session (3 races) each. The results of the day add up to a winner of the Month. The October to July race scores are added up culminating in an annual winning team. Contact the cat-captain (David Boeyinga) for details on how to join and whom to contact in a team. Most teams are in perpetual demand for sailors.